Shrewsbury Town are safe from the threat of relegation, despite losing a seven-goal thriller to Peterborough. The home side fought back from 3-0 down with 16 minutes remaining, only for former Shrewsbury midfielder Jon Taylor to then score an injury-time winner. Taylor had earlier headed Posh in front before Lee Angol added a brace. Jean-Louis Akpa-Akpro scored one and set up Andy Mangan and Jack Grimmer to make it 3-3, before Taylor won it prior to Ian Black's late sending off. Town had to play the last five of the 10 minutes' added time with 10 men after Black was shown a second yellow card for a bad foul. They then had to wait a further half hour before confirmation of the result in the delayed game at Gresty Road, where Doncaster Rovers lost to bottom club Crewe. 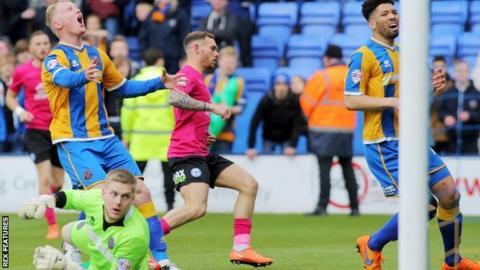 Coupled with Blackpool's 4-0 defeat by Wigan Athletic, which sealed the Latics' promotion, that was enough to ensure Shrewsbury's place in the third tier of English football for a second straight season. Peterborough's win came a week after Graham Westley was sacked as manager, his assistant Grant McCann guiding them to victory in his first game as caretaker boss. "I've never been involved in an experience like that in football. To survive you'd probably say 'job done'. But there are a lot of things going on in my head that I need to work through. "My job when I first came here when I sat down with the chairman was to get promoted and then keep us up in League One. I've done that. But we have to learn from this. "We knew it was going to be a tough season, when you lose key players and can't replace them. The important thing is that Shrewsbury learn their lesson and have League One players. "We looked like we were towing a caravan at times. But that's what pressure can do. It can do strange things to people. It can fuel them on or it can go the other way." Match ends, Shrewsbury Town 3, Peterborough United 4. Second Half ends, Shrewsbury Town 3, Peterborough United 4. Aaron Williams (Peterborough United) wins a free kick in the attacking half. Foul by James Wallace (Shrewsbury Town). Goal! Shrewsbury Town 3, Peterborough United 4. Jon Taylor (Peterborough United) left footed shot from the left side of the box to the bottom right corner. Assisted by Marcus Maddison. Attempt missed. Jon Taylor (Peterborough United) right footed shot from outside the box misses to the left. Lee Angol (Peterborough United) wins a free kick in the attacking half. Attempt missed. Sullay Kaikai (Shrewsbury Town) right footed shot from outside the box is too high from a direct free kick. Sullay Kaikai (Shrewsbury Town) wins a free kick in the defensive half. Goal! Shrewsbury Town 3, Peterborough United 3. Jack Grimmer (Shrewsbury Town) header from the right side of the six yard box to the bottom right corner. Assisted by Jean-Louis Akpa-Akpro with a cross. Shaquile Coulthirst (Peterborough United) is shown the yellow card. Substitution, Peterborough United. Aaron Williams replaces Shaquile Coulthirst. Goal! Shrewsbury Town 2, Peterborough United 3. Andy Mangan (Shrewsbury Town) header from the centre of the box to the bottom right corner. Assisted by Jean-Louis Akpa-Akpro. Corner, Shrewsbury Town. Conceded by Harry Toffolo. James Wallace (Shrewsbury Town) wins a free kick on the left wing. Attempt missed. Marcus Maddison (Peterborough United) left footed shot from the left side of the box misses to the right. Attempt missed. Zak Whitbread (Shrewsbury Town) header from the centre of the box is close, but misses to the left. Substitution, Peterborough United. Callum Chettle replaces Chris Forrester. Nathaniel Knight-Percival (Shrewsbury Town) wins a free kick on the left wing. Attempt saved. Shaquile Coulthirst (Peterborough United) right footed shot from the centre of the box is saved in the centre of the goal. Corner, Peterborough United. Conceded by Jayson Leutwiler.